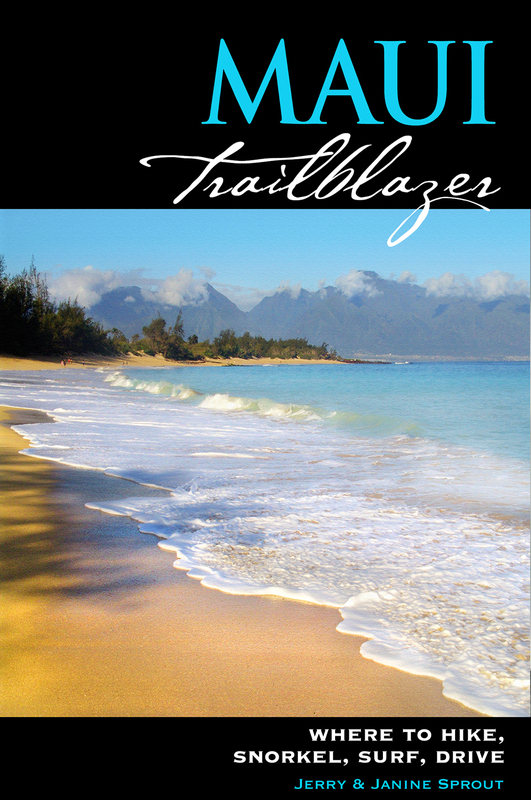 The south coast of Maui doesn't seem like Maui at all: For about 25 miles, Highway 31 rolls and twists through an arid seascape, punctuated by bouldered beaches, a sea arch, side canyons filled with birdsong, ancient ruins. Very few people and no buildings at all. Don't come looking for brunch. 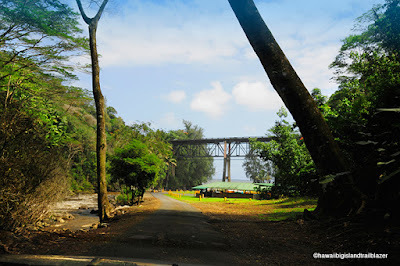 Though the above photo shows a pockmarked section near Huankini Bay, much of the road is smoothly paved and the new concrete bridges are state-of-the-art. 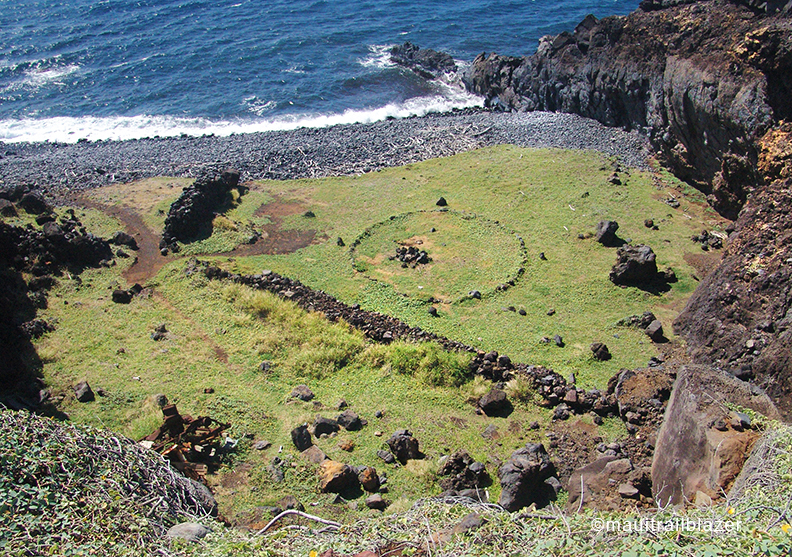 In Manawainui Gulch are centuries-old fishing heaius (temples). 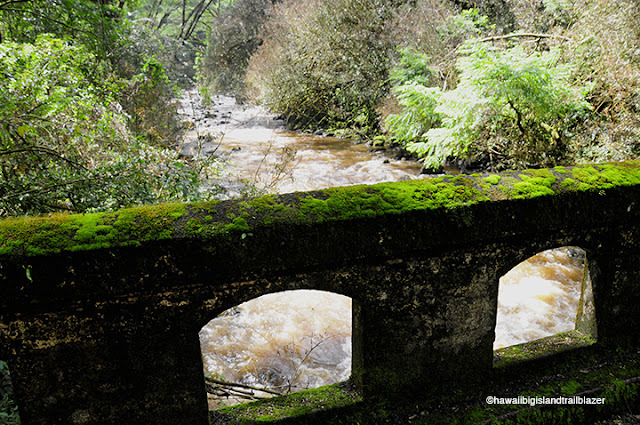 From here, a rugged section of the ancient King's Trail hugs the coast for 8 miles, heading toward La Perouse Bay. 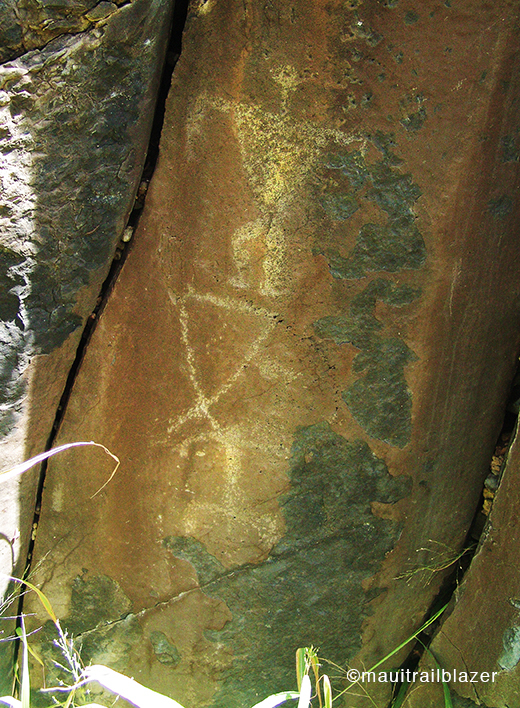 Just before reaching the gulch is the holy grail for adventure seekers: a scramble through catci and brush to the mysterious Menehune Footprints, where small bare soles are imprinted in smooth lava. 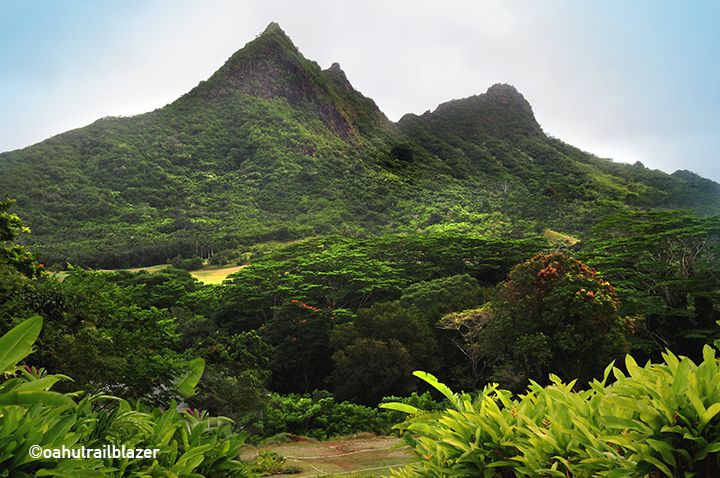 This site is called "New Tahiti," since its hills were guiding landmarks for the first Polynesian argonauts. That the south coast was once heavily peopled is evidenced by the petroglyphs at Nu'u Bay. 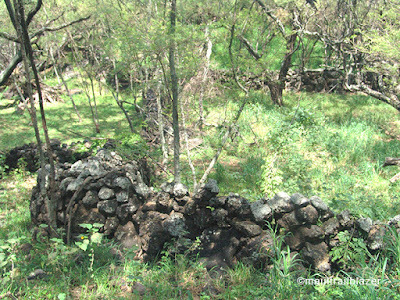 Some of the walls in the area are ancient, while others date from more recent (but still old) ranching history. 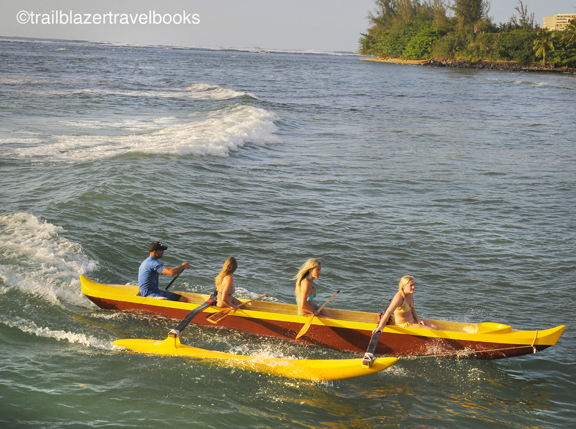 When the ocean conditions are tame, the Nu'u Landing, a rough ramp into an inlet from a lava point, serves up some of the best snorkeling on Maui. 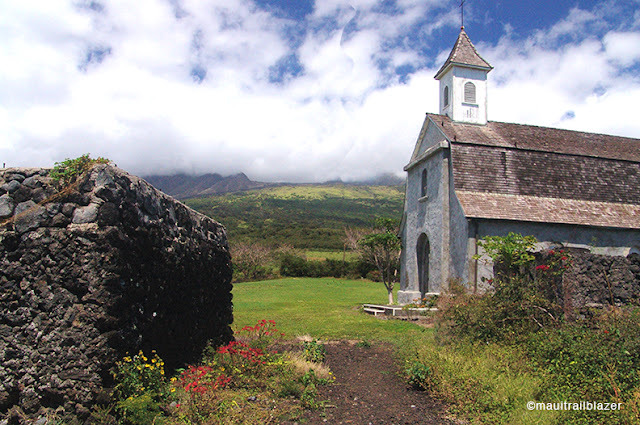 St. Joseph Church has stood since 1862—with Haleakala (hidden by clouds in this pic) rising to 10,000 feet a few miles inland. 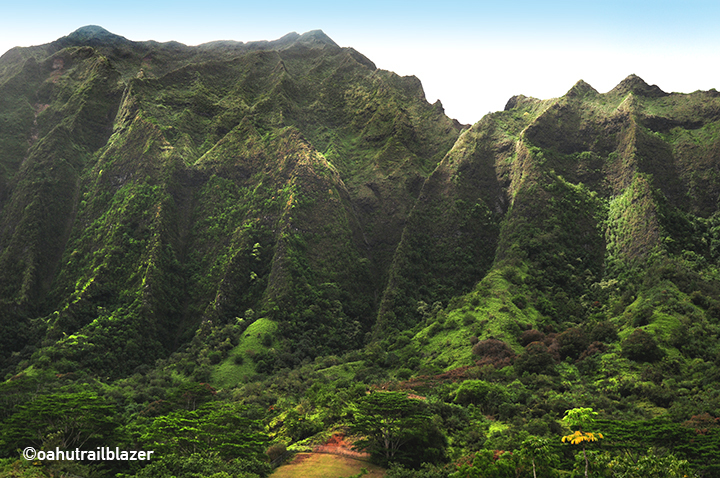 Much of the south coast was included in an expansion of Haleakala National Park. Just down the road is the quirky Kaupo Store, which is open 24/7, except when it's not, a policy that dates from 1925. 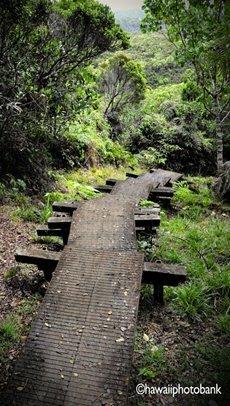 Near the store is the Kaupo Trail: climb 5,500 feet over 14 miles into Haleakala crater. 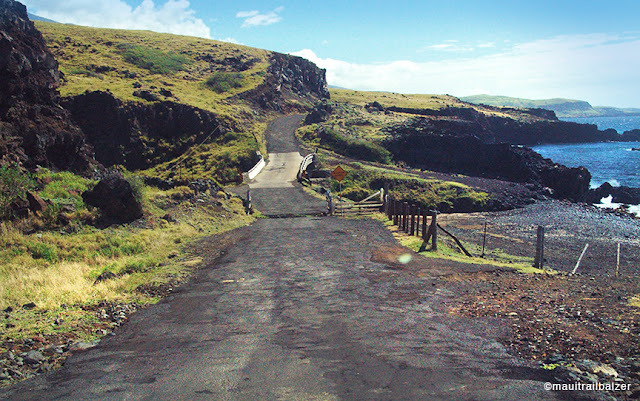 Most people see the Kaupo coast (if at all) as the homeward leg of a clockwise journey from the Hana Highway—though a few miles of this connection are iffy at times due to narrow sections and rockslides. 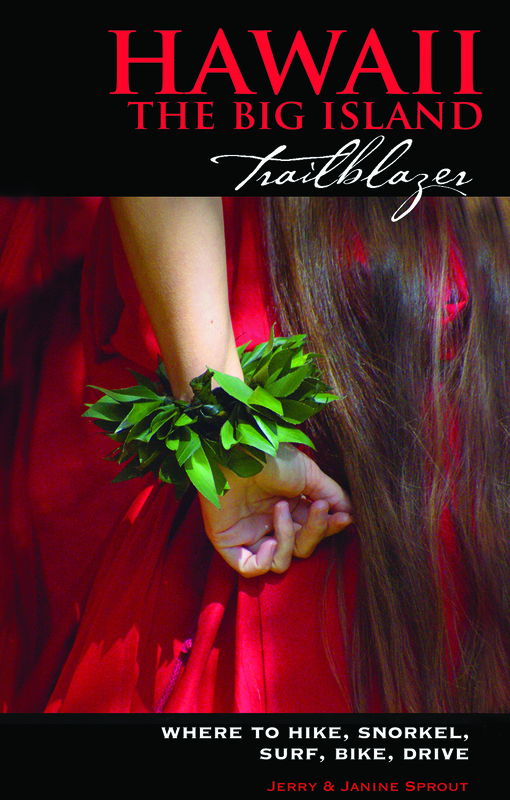 For adventure seekers who want to spend the day here, Maui Trailblazer devotes five chapters. Not many people realize that the Old Mamalahoa Highwy along the northeast coast of the Big Island snakes through the tropical jungle, across green gorges and by waterfalls—the kind of oh-wow driving you expect on Maui and Kauai—only without a conga line of rental cars. 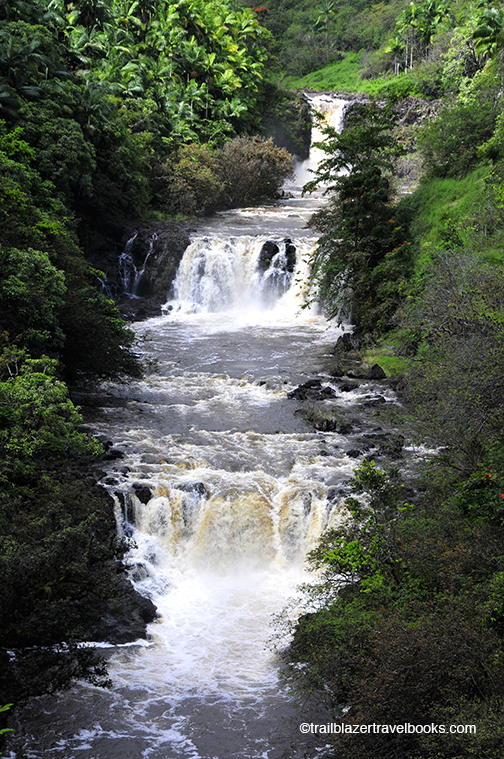 Umauma Falls (above) could be the covergirl for the state waterfall calendar. 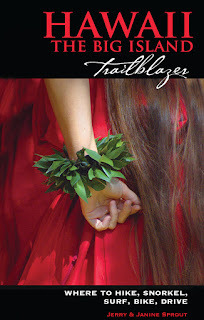 It runs through a private garden not too far north of Hilo. 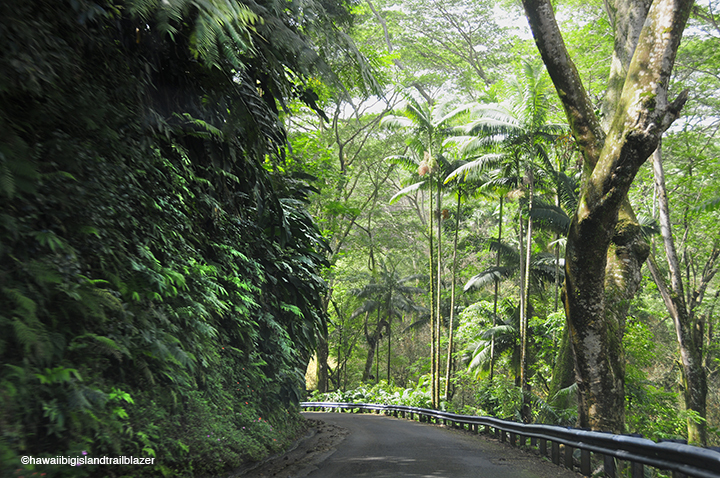 Dodging in and out of the high-speed, two lane highway going north from Hilo are miles-long detours and side-trips on the Old Mamalahoa Highway. 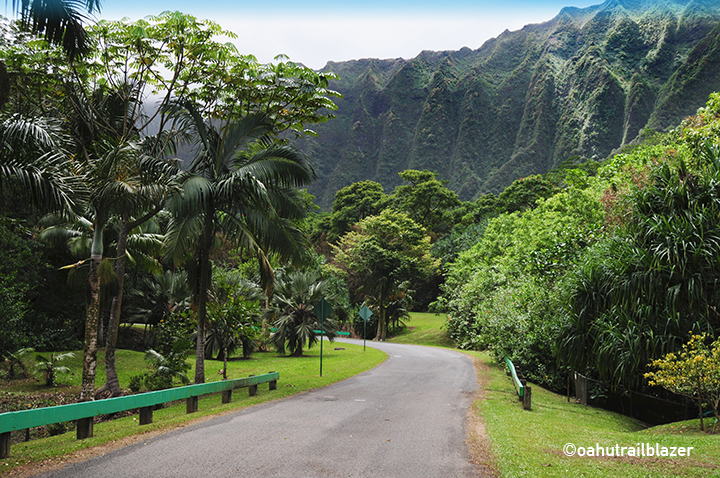 It's a tunnel of vines, leaves and trees, connecting some of the old sugar towns that still portray Hamakua's history. 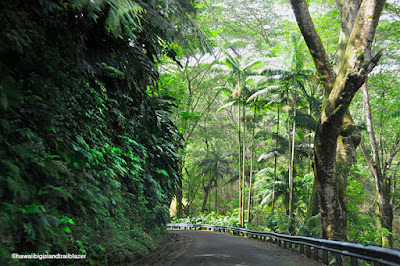 Other roads climb 2,000 feet into forest reserves of huge leafy trees—but you'd have to climb another 9,000 feet or so to run out of climbing, at the summit of Mauna Kea. 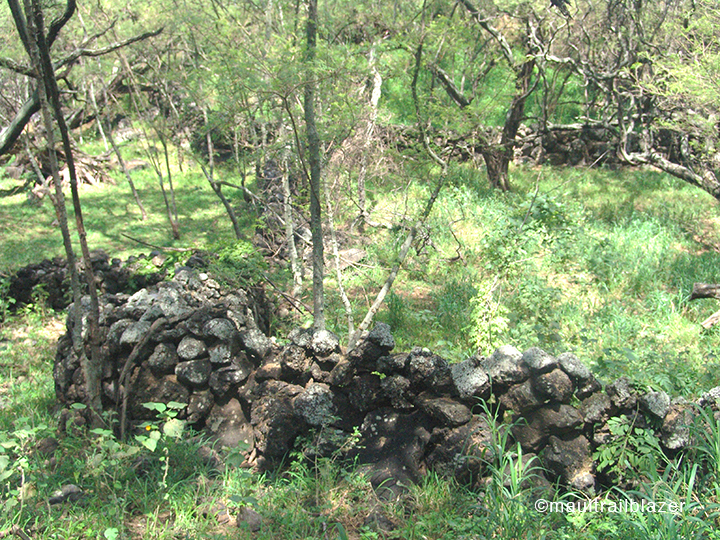 While the lava fields on the Kona side have no streams, Hamakua is sluiced by many. 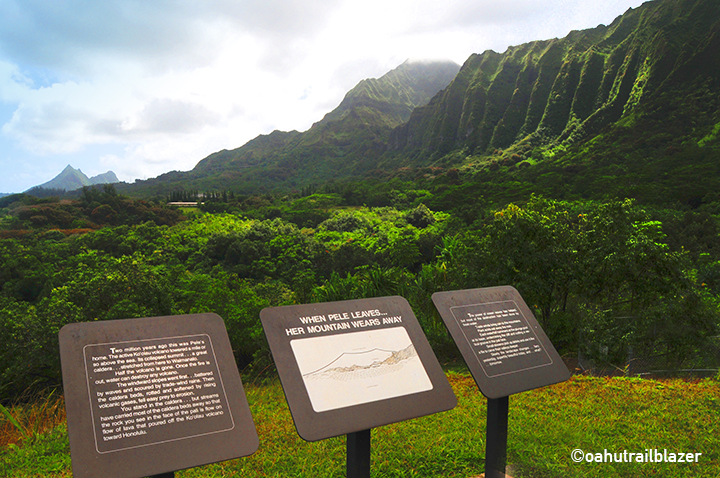 Halakalau Paka (park) has been exquisitly restored by locals. They'll love to talk story, if you show an interest. 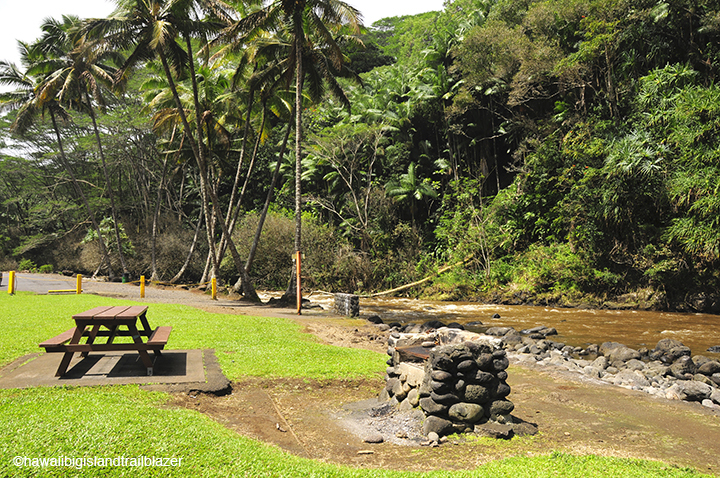 Kolekole Beach Park picnic area and campground are set alongside a swift stream. A cascade almost crashes into the oncoming surf. The highway trestle is skycraper-high above the scene. 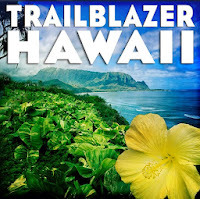 And we haven't even mentioned: Akaka Falls, Hawaii Tropical Botonical Garden, Lahahoehoe (lapa-hoy-hoy) Beach Park, where a killer tsunami struck, and Kalopa State Park—a hiker's dream with rustic cabins and tent camping. 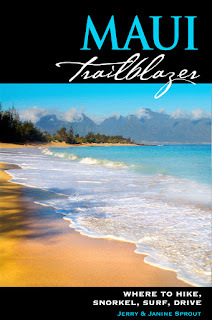 Hawaii the Big Island Trailblazer has the details. One look at Hanalei from above (in this case, from hidden Hanalei Organic Park in Princeville on the north shore) and you will be hot to get down there and look around. 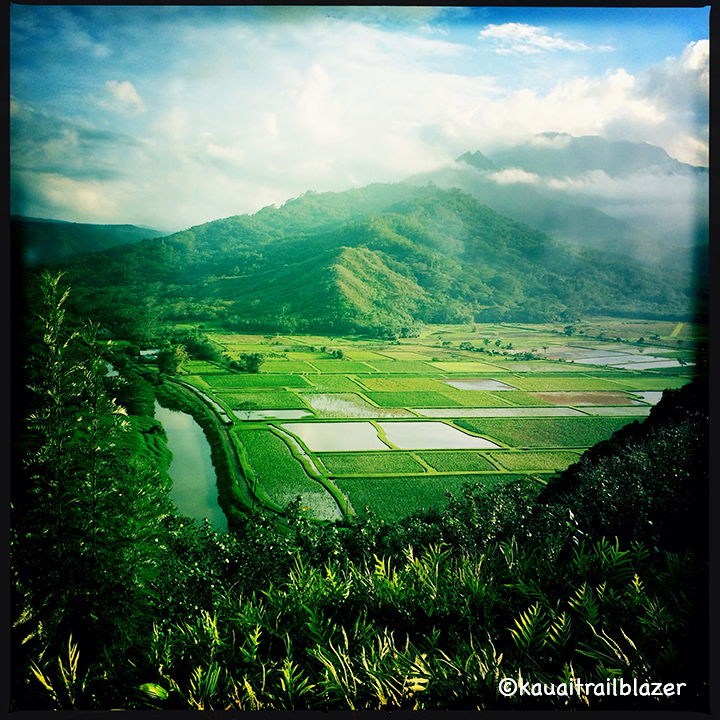 Taro fields flank the Hanalei River—part of a National Wildlife Refuge—an opportunity for a long, mellow kayak adventure. Several companies offer rentals. 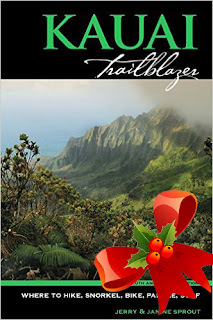 A mountain hike (the Moonshine Trail) is a pleasing and exciting alternative to the Kalalau Trail, the popular excursion just down the highway. 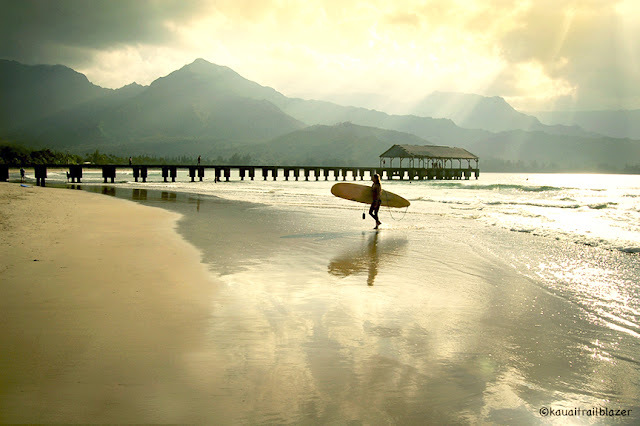 Black Pot Beach, at the far end of Hanalei Bay, presents some of the best beginner surfing in Hawaii. Lessons are available, right there. Beyond the shore are some big-boy waves, at Bowls and Queens. 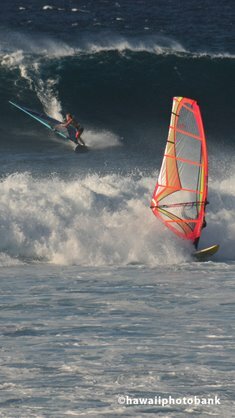 Farther out is Kings, which only breaks when waves are epic. 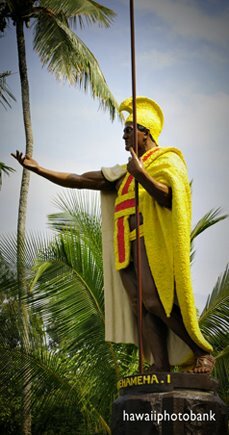 Local legend Titus Kinimaka first rode that monster in the 1990s. In the middle of the bay is Pinetrees, home beach for pro surfer Bruce Irons and his late brother Andy, who was a world champ. 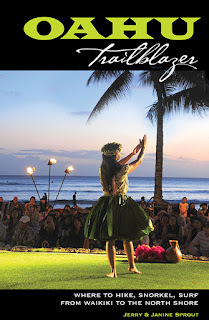 The takeaway: Hanalei is Surf City on Kauai, and one of the top venues in the state. Hanalei Pier has been the darling of many movies. 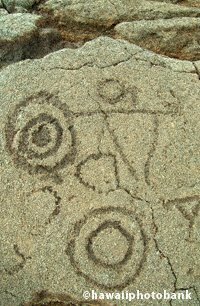 Most recently, George Clooney walked by in the Descendants. 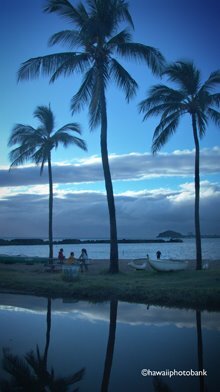 The boathouse on the end of the pier is a box seat to watch the near-shore surfers, and to admire the jagged rim of towering mountains that frame the scene. 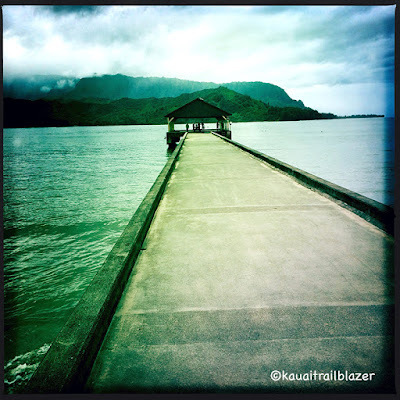 The two-mile sandy shore of Hanalei Bay is just a few blocks from the quirky shops of Hanalei Town—maybe the best walk-around beach town in Hawaii, with galleries, bars, restaurants, and giftshops. 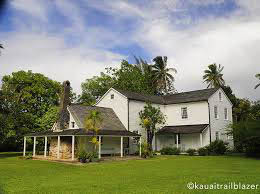 On the green fringes of town is the Waioli Mission House (below), built by the Wilcox family in 1841. 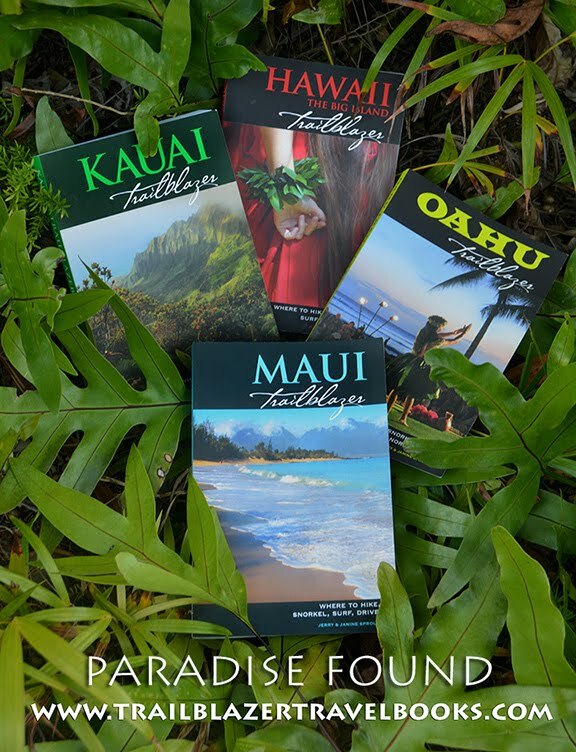 Hanalei is not flashy, but normally millionaires and a few Hollywood types will be shuffling around in flip flops among other sand-footed and sunburned tourists. 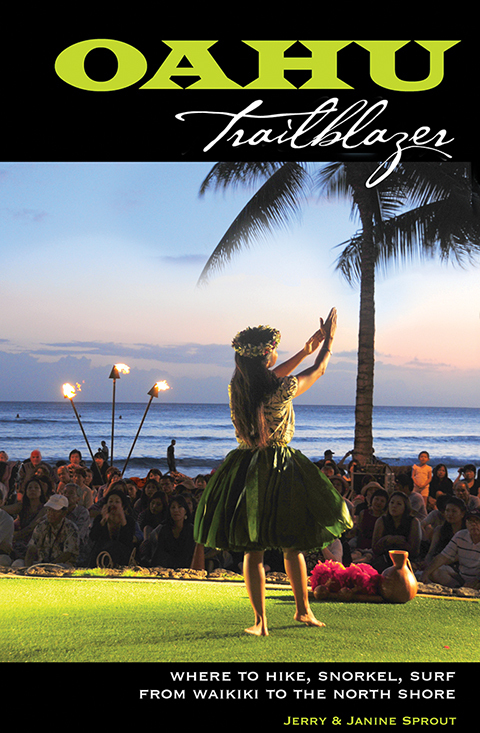 This place can get you hooked on Hawaii for good. 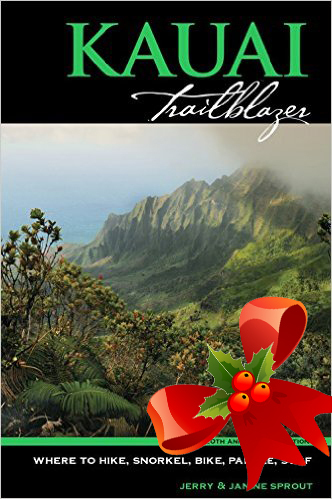 More details on Hanalei, and other stuff nearby, are in the 20th anniversary edition of Kauai Trailblazer, released last month.